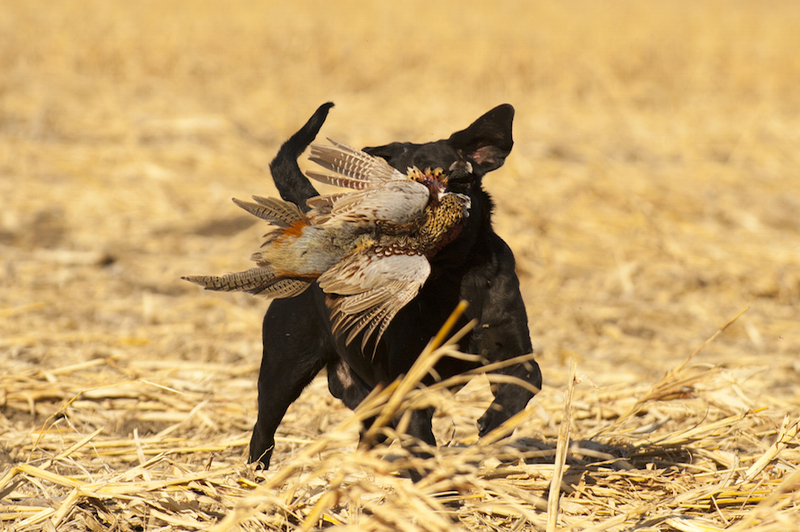 As all pheasant hunters know, pheasant hunting in South Dakota is all about the dogs. Sure we want to have a successful South Dakota pheasant hunt but part of the fun is watching man's best friend work the fields and flush roosters. At Rooster Ridge we have professional trained, world class South Dakota pheasant hunting dogs available for every hunt. Pheasant hunting is South Dakota is about friends, great hunting and great pheasant hunting dogs! A Pheasant Hunter’s Best Friend! One of the highlights at Rooster Ridge is hunting over our working retrievers and pointers. Our kennel includes three generations of the finest working Labs in the country. Whether it’s breaking through dense cover to flush a rooster or making a spectacular retrieve, our dogs are happiest in the thick of the hunt. Interested in bringing your own hunting dog to the lodge? We encourage hunters to bring their hunters and the Rooster Ridge guides will do a great job helping you work your hunting dog along side the Rooster Ridge pack. Attached directly to the pheasant hunting lodge you will find dog kennels for your companions to stay in comfort. Or you are welcome to have your buddy join you in the lodge - kennels are recommended, but not required, for dogs sleeping in the lodge. This is a dog friendly facility! Interested in possibly adopting one of our seasoned hunting dogs. We offer a program to provide a comfortable retirement for our hunters that can no longer handle the long grind of the hunting season.